The accurate drafting of cows into groups is an integral part of herd management on farms. It can be a frustrating and time consuming process if the system is not well designed. Accurate drafting is becoming more important as herd sizes expand. This is probably why New Zealand dairy farmers voted automated drafting systems as the technology that they would most like to have in their dairy. A good automatic drafting system will identify cows selected for drafting and then draft them as required - accurately, reliably and with as little disruption to cow flow as possible. The drafting system must also provide an easy to use interface to select cows for drafting. An automated drafting gate showing the race and sorting gate. Consistent cow flow is critical to the success of automatic drafting so it is preferable the system is installed a short distance away from the dairy exit (so the cows are not distracted by milker activity). The race should be a minimum of two cows in length (4m), and a constant single cow width (760-820mm) for the length of the race. Variations to cow travel paths should be minimised with the drafting path being the same as the exit path. 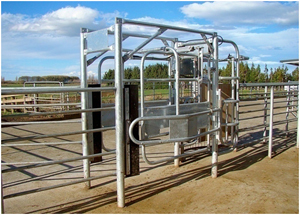 Holding pens that are parallel with the exit race will also assist cow flow. Poor EID function can reduce the reliability of the system and may result in cows being missed, depending on system defaults. Operators must have confidence in the system and minimum acceptable standards should be discussed and agreed upon before any purchase is finalised. The behaviour of the cows as they exit the dairy greatly influences the results achieved by automatic drafting systems. The facilities rely on cows behaving calmly and predictably. Agitated or fearful cows are very difficult to draft, manually or automatically. Properly functioning drafting systems remove a lot of stress from milkers. The milker should not have to leave the pit to draft animals. Many farmers rig up their own sets of gates and pulleys to facilitate this. The information given here on automated drafting systems is generic in nature. Keep in mind that specific information about particular commercial products is best sourced from industry suppliers. Also, it is a good idea to visit other farms and seek testimonials from other farmers about different options and products before choosing your own.